I’ve never been to Stainless Games’ office, situated right in the centre of the Isle of Wight, but I’ve always imagined they’re just bouncing around to Reef and the Spin Doctors while buzzing on Sunny D and Cheese Strings as their Global Hypercolour t-shirts begin to go a funny purple from all that activity. There’s nowt more 90s than their games, basically, and that’s as true as ever even after the studio has moved on from the Carmageddon series that made its name. ShockRods, Stainless Games’ all-new IP, is somehow even more 90s that what went before it, and I mean that as the highest compliment. This is the high adrenaline arena shooter of the late 90s combined with the high octane thrills that Stainless Games are famous for. 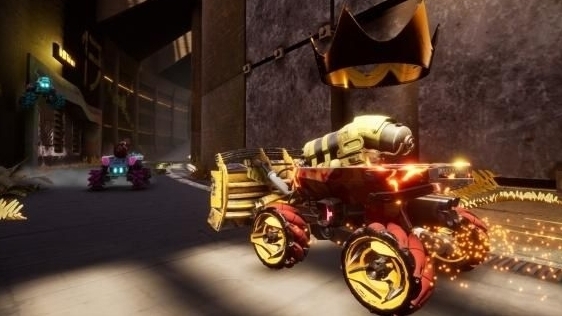 It’s Quake meets Rocket League, if you want to be super reductive – and who doesn’t! – and even in its incubative form, it turns out that’s a formula that works. This is a 6v6 shooter – or 12 player free-for-all, if out and out chaos is more your flavour – with arenas that are nicely compact ensuring you’re never more than a handful of seconds away from some serious action. This is a vehicle-based shooter, but the emphasis is very much on the shooting – in team deathmatch, it feels a lot like, well, team deathmatch, with movement akin to a traditional first-person shooter (thanks to the dynamics of the cars, which have ‘hi-tech’ wheels that allow them to move along any plane and that are also equipped with jump boosters). It feels like a very old-school team deathmatch game, too, with pick-ups littering the field, rocket launchers and, of course, a quad damage multiplier up for grabs too. The maps, meanwhile, feel like very old-school maps, fashioned out of furniture and backdrops – sci-fi woodlands and impossibly large hangars – that are innately, purely video gamey. In that way, it’s as pure as it gets. When you’re playing the ball game, with rules that should be fairly self-explanatory, it feels kind of like Rocket League, even if you’re stuck fast to the ball rather than punting it around. Throughout all that, though, it feels every bit like a Stainless Games’ joint, with an anarchic heart beating along to the much-loved rhythms of 90s PC gaming. It could be something pretty special, and it’ll be interesting to see it take shape when it hits early access this summer courtesy of Green Man Gaming. Oh, and I should also note that it’s playable over the next couple of days at EGX Rezzed in London (and also note that the show is the work of Eurogamer paymasters ReedPop, so I’m literally being paid by them to write this. The horror of it all).